There is a hot yoga studio hidden about a hundred yards from the door of my Fremont office building. The studio is located at the funky convergence of a tattoo parlor, a Burlington Northern train of garbage dumpsters, and, so help me God, a stray alley cat somebody fitted with a nose ring. If nobody has kicked into it yet, a fold-out street sign should be pointing in the general direction of a tattoo place, but finding the yoga studio from there is like finding the wand shop on Diagon Alley. It has been hidden in plain sight. The first time I went looking for it, I stood by some kind of empty Amsterdam brothel window staring at a red Google dot that told me I was “here.” But I had the good sense to follow a woman with a macramé bag and I learned you need to go inside the tattoo parlor, which, psyche, isn’t even a tattoo parlor! It’s actually a restaurant! With Russian pelmenis and appetizers with lots of tch-sounds and, oh my God, off to the side for no explainable reason there are milk crates of 70’s vinyl that are from, like, the 70s! Blondie! Doobie Brothers! 25 or 6 to 4! But you will never find the wand shop if you keep falling for muggle distractions, and if you’re late they will lock you out of class. So keep going and don’t make eye contact with the Russian counter guy, because you’ll need to buy something if you do. Just make your way towards the back. Step past the homeless people arranging plastic bags on the metal cafe tables, and when you get to the back wall, feel for a glass panel door that is hot to the touch. Place your palm on it. You’re home now. Temperature is my yoga studio’s only signage. Until I’ve worked my way down a yoga class pecking order and established myself at Omega I really can’t focus, and the first time I attended my new studio was no exception. I tried to lie quietly beforehand in a feigned ‘Yoga Guy Public Stillness,’ but the only free spot was directly in front of the instructor’s mat and below the main broiler element. As a result I couldn’t find a “calm down before we get started” position: not lying on my back, not sitting cross-legged, not back on my bent toes. Not even a third return trip to lying on my back with splayed thighs was working. Oh, lulu lemon! The pretty, young receptionist who turned out to be the instructor came in and got us all started. At first I was doing fine as we moved through the Jack LaLanne circle stretches and slow breaths. I even began to wonder about fifteen minutes into circle sweeping whether maybe this class was going to be ‘hard enough’ for me. This is an observation that grew funnier in a bitter, regretful way, because about halfway into the forty seventh downward dog I started to feel lightheaded in the insane heat and my Homeland Sanity switchboard lit up like Battlestar Gallactica. …Abandon Warrior battle station… Drop to child’s pose immediately. Hit the deck… This is not a drill… There is no pecking order below Omega. If you pass out you will not be able to come here again… I repeat this is not a drill! So I fixed my forehead obediently to the mat where it was one entire degree cooler, and the rest of the class continued plowing and binding and crowing. I watched their upside down eyes and handstand ponytails with nauseous appreciation. Every so often the teacher would come by and push my bottom down gently because when I’m in child’s pose it tends to pop up like an infant on the diaper changing table. Generally speaking, I’m not very good at the yoga ‘animal’ positions, but at the end of that first class I found myself exhausted and wiped out in a perfect Sleepy Kitten, lying on my right arm and staring at the cracks in the drywall. A good yoga class always ends the same for me: where I’m making small meow sounds that nobody can hear but maybe my nearest mat neighbors. Afterwards in the lobby I tried to pull black dress socks over my moist feet with telekinesis, but by the second sock the effort was too much for me. I ended up putting a bare foot into an untied dress shoe. The young instructor asked how it went and I rolled my eyes back in my head to acknowledge that I’d heard the question. Too beaten to dress, I wore my leather jacket, a bare chest, and my dripping swim trunks back out into the alley. I carried one of my socks in my free hand. An elderly gentleman at a cafe table corrected the angle of my steamed-up glasses. To be honest with you, it was the first time I looked like I belonged in Fremont since I moved into the neighborhood. Just down the hallway from my office door, there is a bike commuter shower that I use after yoga. The shower is tucked into the side of an absurdly oversized bathroom stall. It’s probably fifteen foot by six in there, and yet for unfathomable architectural reasons the toilet practically abuts the shower. If you had a mind to, you could dry sprinkle your feet in the shower while you sit on the toilet. In the same we’d-rather-you-don’t-actually-shower-here architectural spirit, there’s no place to hang or set your things while you’re showering. So I store my clothes and my towel on the floor on the opposite end of the stall, furthest from the invisible, but undoubtedly very real, Gaussian perimeter of urine spray. Other than the improbable fact of a shower inside that stall, there is nothing else to make you feel that this is an area where you should be showering. No black interlocking floor mats, no shelves, no Midnight Express towel hooks, no tile set-offs that suggest you can get the floors wet in a certain area and it’s okay. There’s nothing to welcome you from, say, yoga class into the Life of the Shower. It’s like taking a shower at a bus station. There’s something totally unreal about taking off your clothes in there. It is quite literally like being naked at work which is already kind of Christmas Party ‘out there,’ but I find post-yoga showering in my office bathroom makes me feel even more naked than that. It’s almost like I am so naked that I get somehow skinnier too. I actually lose body mass from the bathroom design. It is like I am in a dream of being naked and am arriving late for a final exam because someone I trusted gave me a pill that all it does is make you feel really, really naked, except for maybe wearing just one sock. I think the only way for you to understand the vulnerable, naked feeling that I get showering in the bathroom stall at the office is to have you mentally picture me totally naked, tip-toeing from one side of the stall to the other nervously rolling a squirrel clump of clothing in my hands looking for a place where my things might be safe, all so I can take the final exam I didn’t even know about until just now. OK, I think we’re all there. You’ve been very patient. Thank you. I step into the plastic shower and it buckles slightly, sending plastic Richter waves through the walls. I have to lurch to brace myself with my last two calories of strength. There is a fold-out handicapped Medicare seating contraption on the wall, but as tired and desperate as I am to sit down after yoga class I’m still not sure I want Athlete’s Foot in the crack of my bottom. And I need to stay vigilant on my wallet and clothes because every time people come in to use the bathroom while I’m in the shower, I imagine them spotting my wallet under the stall door and deciding to steal it and run. I imagine them thinking through their odds as they very, very slowly dry their hands. I’m shampooing just feet from them, but it’s like a suspense movie face off between me and the visitor I can’t see. They are listening for witnesses in the hallway, and I get very still in the shower and wait for the metal knob on the stall door to begin to turn like in a Hitchcock movie. I swear to you, the tiniest movement of that metal knob and I will prance out of the shower like I’m on a slip and slide. In my mind’s eye, I sprint down the hall after the thief like a Jamaican linebacker. I catch the S.O.B. and hold him by the throat in the stairwell. I push his terrified eyes and head back into Lenin’s big statue red hand right out on the streets of Fremont. A crowd gathers. This guy will not be able to believe anybody this so incredibly naked for a final exam would come after them for the simple prank of stealing their clothes, but they were WRONG, M!*@&%$er. He is so mistaken even I feel sorry for him although my tough guy face doesn’t show it. The crowd applauds. I kid you not, this is EXACTLY what I think about in the shower. Deep, full breath. Lion’s exhale. Ommmm. I love yoga. It helps relax me. The instructor who’s usually at the studio when I go is young, and there’s probably a reason I shouldn’t admit this, but I thought she was the receptionist when I showed up that first night. She greeted me in a bright, cheery way. She was sitting at the table in front and took my money and tapped things into the yoga software. She remembers everybody’s name, and she used my name the second visit which threw me, and I internally jinxed myself on remembering hers. For the next few visits I vowed to remember her name and couldn’t. I would pause in front of the dumpsters outside and I would look it up right before I went in and then I’d stand in front of the reception table and it would just be gone. Something with an S. No, something with a Z. No! Something with a vowel. I even tried to cheat and look up her name on my iPhone while changing before class so I could find an excuse to use her name out loud, but there’s only one Verizon bar down there. There’s a generic yoga teacher style that is about 70% of the non stretching portion of the job, and we all know that 70%. There’s a basic way you’re supposed to act, a kind of spiritual fitness goodness persona you adopt as part of the job. And they have to act this way or you’re not even sure if you’re in a yoga class, and then there’s another 20% that you discover about them personally in the first class and the best part, the last 10%, you get to over time. Like, for example, why they are really teaching this class and care about yoga and what this whole thing means to them enough to make a life of it. Because that 10% is always pretty serious with yoga teachers, and I like that about the profession. Which gets us back to the teacher whose name I can’t remember. She is sweet and soft-spoken in temperament, but she likes to push us really hard, harder than 90% of her demeanor would suggest. It’s a kind of velvet coaching strategy. One class she asked what people wanted to work on in a soft voice that I no longer trust, and somebody who couldn’t keep their trap shut said ‘lower back,’ and at the end of the class we could barely lift our spray bottles and the teacher whispered softly ‘that’s why people don’t usually suggest anything.’ I both loved and hated her for that observation. She has two themes that I’ve started to pick up on that stand out above the others. The first is a continual instructional return to ‘focusing on our breath,’ and how ‘the breath is our practice,’ and ‘the poses simply allow us to breath in different ways and forms.’ I have dutifully tried to imagine the energy in the air becoming a source of energy in my body. I do mental highlighting with blues and reds and greens where parts of my body light up like one of those Radio Shack speaker grills that used to light up based on the music you’re playing. And when I remember, I fill my mental body with waves of colorful Borealis energy. But there’s a deeply rational part of me that wants to say oxygen is great and important, but it’s not magical, and sometimes these kinds of lessons around breathing suggests that it is magical, or near-magical, and while I do try to find the magic in it, and I even hold out some hope for the magic in it, but sometimes I have to drop to my knees in plank anyway because, well, it’s not working. There really ain’t no magic there. And I’m old enough, and just wise enough, that I don’t believe our lives are about finding the hidden magic buttons. Alas, realizing that is part of being grown up. But my teacher has a second theme that has jumped out for me, and which is why I’ve invited you all here today. This second theme has an interesting, non-generic yoga teacher idea in it, and it has caught my attention. Her second major theme is that yoga is a practice about ‘finding comfort in the discomfort.’ That is her exact quote. She says we should find our spot of discomfort and, I’m paraphrasing now, make peace with it somehow. The practice of yoga is a chance to remain in the presence of what is unpleasant. In this way yoga is a practice for the rest of our lives, the ‘real yoga practice’ she calls it. We put ourselves in awkward positions at the limits of our strength and mental powers and wonder how long we can hold out. The mind wants to flee and offers a million reasons to do so. The body just screams and doesn’t “use its words” as we used to say of our children when they were very small. My teacher’s continual assertion is that yoga is about finding balance in that space. And this movement towards discomfort and grace under pressure is the 10% of my teacher’s instruction that has my complete attention and has been slowly taking root in me. My guess is that her own practice pivots there, that this reconciliation is the core idea around which her practice turns. Because when you remove the adornment of all the namastes and thank you for coming this lovely evening and how’s our week starting off and the softly-spoken manner, when you remove all that and maybe even the slow breathing mantra, when you remove all the trappings of the profession – you find a person who has learned something valuable in yoga about moving towards discomfort as a life practice rather than away from it. And I was headed to the car last night after yoga, after the defenseless shower, and the hasty dress in the stall. It was dark already and I locked the door to the office, walked down the corridor, past the naked man apprehending a thief in the stairwell, past the bare chested man limping home in a leather jacket and dripping yoga pants, past Vladimir Ilyich staring into the horizon of an endless succession of five year spiritual plans. And I was moving fast, really fast. I’m always moving fast, sliding like a pinball, racing towards or away from. Bright lights and sounds. Noise and flashing. I cut quickly through the parked cars across the small street in front of the office building because I didn’t want to walk the extra fifteen yards and have to wait for a light. I’m racing, racing, racing, hurdling through my day, trying to get to the other end of it like an exhausted swimmer, to the sanctuary of home and hopefully not a lot of domestic stuff to do or pick over, and then I see another light is about to switch on me to red and I’ll have to wait there. I just missed it. There’s a wave of damn it. That light will cost me like a minute of time standing there for nothing! What will I do with myself? I’ll have to take my phone out and check it, check it, check it. And suddenly I heard my yoga teacher’s admonition from the class about leaning into the discomfort. 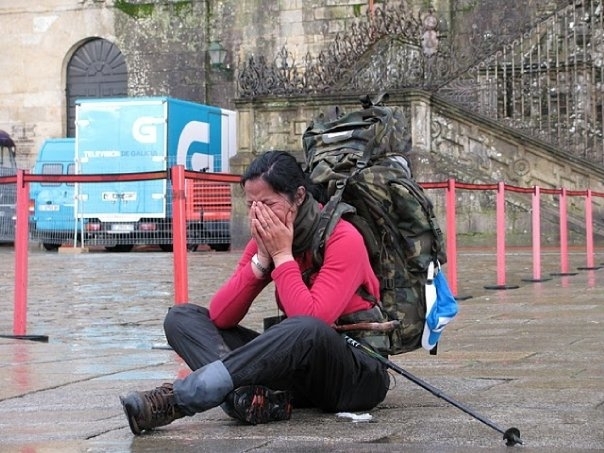 I noticed that this hectic racing feeling is a kind of discomfort, too, and I’m fleeing it in the same way I might lie in pigeon on my mat, with my T-bands gnawing at me, my pigeon hands cramping tensely in front of me, my breath strained and choked. And I’m always fleeing that discomfort, maybe all discomforts. And so I decided that I’d wait for the light instead of racing across and I’d just meet the discomfort head on and see if I couldn’t, in my teacher’s words, “find a little comfort there.” And I stood for the 60 second cycle to the next green light and faced the thing in the interim. Oh, the thing, the thing, the restless thing. It is a small discomfort this energy, but it is an ever-present one, as persistent as a shadow, and I held this nameless yoga pose like I was momentarily balancing a steel ball on a rubber flipper. I didn’t take the phone out. I didn’t reach for the crossing light button to pump it along. I didn’t try to make the feeling go away. I wasn’t trying to fix it. I almost needed the feeling to remain for this nameless pose to make sense. I don’t know if you could say I was still exactly, but you could definitely say I wasn’t moving. There were drivers in their cars on their cell phones. One of them was reading something, texting and driving. Pedestrians whirled by. A bicyclist on a fixed gear bike slid to a stop in front of me for a moment and then lit a cigarette. Motion everywhere, within and without. 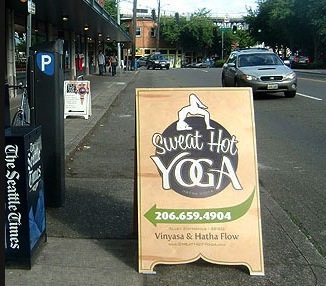 NB: Sweat Hot Yoga is officially at 3516 Fremont Place North, Seattle, WA 98103, but I think you’ll find my directions are better.